Following the recent post on the art and sole of carréducker, we bring more insights about what sets a bespoke shoe apart from its biscuit-cutter alternative. Young Mrs Tweed shared a pot of Assam golden tips tea and lemon chifon cake with Deborah Carré and James Ducker of carréducker, the bespoke shoemakers, to ask a couple of questions and unravel the mystery. The sharpened pencil was poised and the questioning began. Many thanks to Carré & Ducker for providing their time and such interesting responses. Typically, we see the customers at our workshop at Gieves and Hawkes, Number 1 Savile Row. We make the shoes here behind a glass screen on the shop floor. At the first meeting, we measure the feet; do a design consultation where we ask about the customer's wardrobe and what the shoes are going to be worn with. We also choose leathers and design details together. We then have the lasts made by our last maker in Northampton. Next we make a pattern and a pair of uppers and brace them onto the lasts so that the customer can try on the shoes. We always do one fitting, often two and sometimes more. It is a bespoke process and everyone's feet are different. 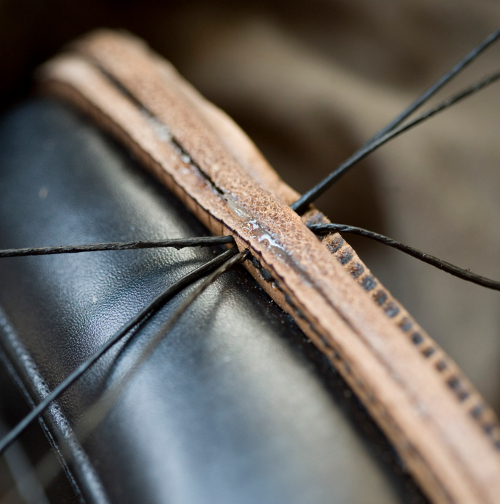 Once the fit is perfect, we make the shoes by hand using only hand held tools and no machines. We follow up with a call or email one month after the client has taken delivery to check all is well. Sometimes we have to make further adjustments as it is only with wear over a period of time that the customer can get a feel for the true fit of the shoe. How long does it take to complete the shoe-making process? It takes between 6 and 8 months to deliver the shoes, depending on how available the customer is for fittings. 5 to 6 months for subsequent pairs. Could you explain a little more about the craftsmanship behind your shoes, the skills required, and the various stages in making the product? 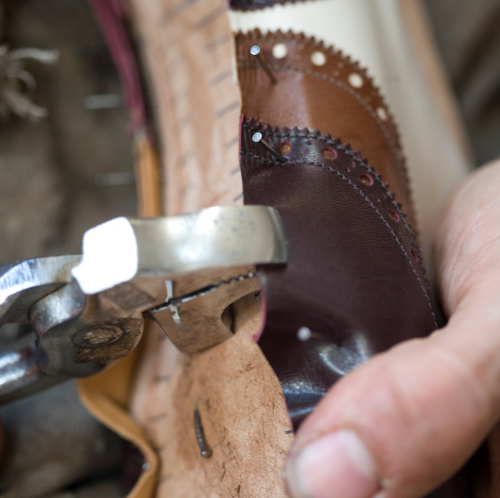 Every process is done by hand, from the last making to finishing the shoes. 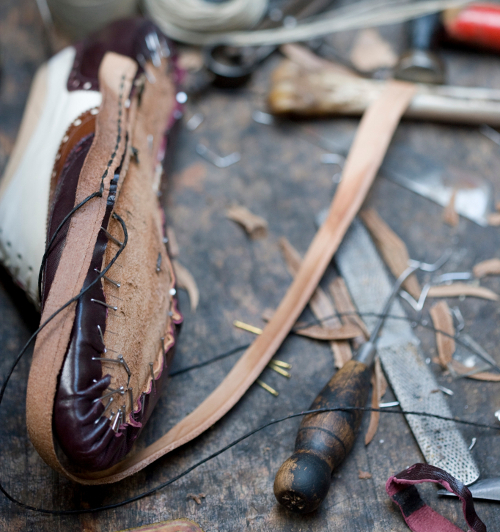 During the making, we prepare an insole with a paring knife; last the shoes by hand (stretch the uppers onto the lasts); hand welt the shoes (attach the upper to the insole and insert a strip of leather between them); hand stitch a sole to the welt; build the heels by hand using glue and nails; and finish the shoes by hand using glass, sandpaper, ink and wax. Difficult to say. We design each shoe for each customer, so the styles always vary. Of the samples in store, the most popular ones are the Half-cut and the Saddle Boot. Our markets are about 25% UK, 33% USA and the rest from the rest of the world, especially the Far East. wearing a pair of bespoke shoes compare to wearing a good pair of quality shoes in the right size? Firstly, when we see a client to take their measurements we also take a foam impression of their feet. This ensures that shoes made on their lasts give their feet the utmost support where they need it. So the experience of bespoke shoes is very different. Secondly, the leathers we use are of the highest quality, and once you have broken the shoes in, the leather moulds to your foot shape. Thirdly, it's that frisson of knowing that you are wearing shoes commissioned by and made for you alone - a subtle, secret pleasure. A client recently said when putting his bespoke shoes on for the first time, "I've been to the Taj Mahal, walked the Great Wall of China, but this is something else." We love that. What are the characteristics of the leather you use in your shoes? Which are the best leathers? We use top quality box calf leather for the uppers, from Poland, Italy and France - and the quality is such that the uppers should last 15 to 20 years if you nourish and polish regularly. We also use exotics such as alligator, lizard, ostrich and snake. What's the profile of your customer? Very varied, from billionaires who order a pair of the same shoes for each of their houses around the world, so that they don't have to travel with luggage, to those who have a passion for the craft and save up to get their one pair of bespoke shoes. In between, we see a lot of international businessmen who pass through London on a regular basis. We also have a number of gents who have problematic feet or who find it hard to buy ready to wear shoes. Tweedy's thought: What you get from a pair of bespoke shoes takes footwear to another level. It's fantastic that the skills and craftsmanship that go behind a pair of handmade carréducker shoes is appreciated around the globe. A fantastic advert for British craftsmanship.